5 Ways to Wear Leather Pants Without Looking Like a Delinquent: Spot-On Celebrity Styling to Copy! Do you think wearing leather pants is difficult to pull off? We feel you. They’re not for everyone and can be quite intimidating for an average girl’s usual aesthetic. But if you want to brazen it out and inject an element of surprise to your wardrobe, edgy leather pants will definitely come handy. On the other hand, not knowing how to balance out the edginess of leather pants poses the risk of crossing over the line of looking like a delinquent (especially if you are going to sport heavy makeup with it). So, below are a few tips as well as celebrity outfits to copy if you want to wear leather pants correctly. 1. Balance the toughness of the leather with a sweet-looking collared top. Toning down the tough factor of the pants can be done if you wear a feminine top with them. Do what actress Emmy Rossum did here and pair a floral top with a contrasting white collar with your leather pants. Finish off the look with a pair of classic Mary Jane pumps. 2. Wear them with a cropped top and a bomber jacket. 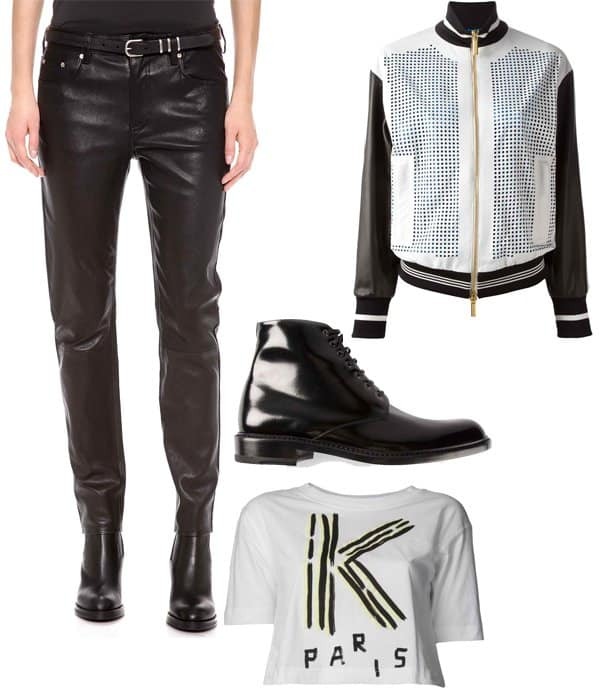 Now that you are in the mood for an edgy ensemble, go the extra mile and wear a cropped top with your leather pants. Moderate the exposure of flesh by wearing a cute bomber jacket. British model Cara Delevingne is your style inspiration. 3. Pair them with a boxy sweater. 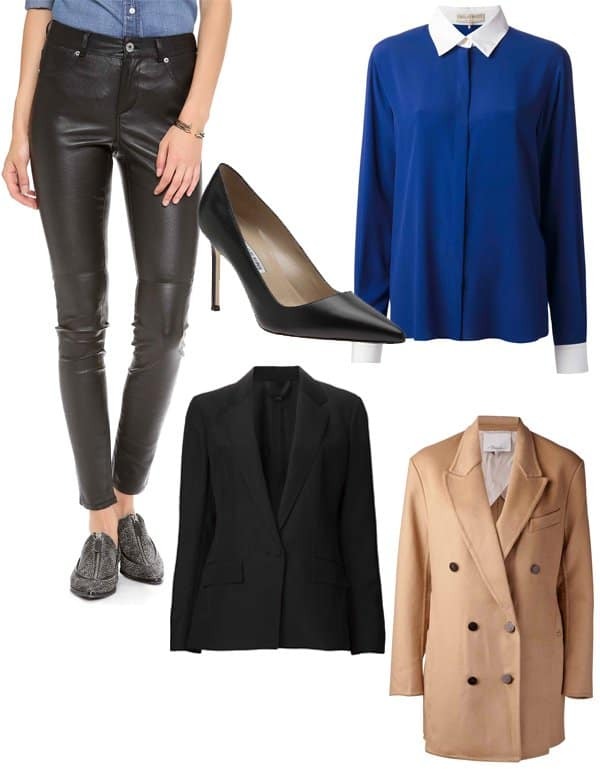 We’re all about balance, so if you want to wear skinny leather pants, try making the silhouette more interesting by wearing a boxy top or sweater. Like Rihanna, style it with a printed cap and a pair of white pumps. 4. A button-down shirt layered with coats or jackets can give your leather pants a street-style vibe. Leather works so well in fending off the cold. Use this as your layering canvass. Try Zoe Hardman’s London Fashion Week look. She wore a button-down shirt and then layered a blazer and a coat over it. 5. Pair them with a textured top. A textured top can lessen the austereness of the pants. Karlie Kloss wore a fur top with her leather pants, but you can also go with lace or a top with floral appliqués. Just follow these styling methods, and you won’t have to worry about looking like a society menace in your leather pants.